“…twenty seven years, the thirty-third cycle which is called 'a soil and a hare' out of a sexagenary cycle. Shakyamuni Buddha was forty-odd years, the Great Teacher Tiantai was thirty-odd years, the Great Teacher Dengyou was twenty-odd years, they had needed these years to accomplish the purpose of their advents. I have spoken repeatedly of the indescribable persecutions they suffered during those years. It has taken me twenty-seven years. Great persecutions during those years are what everybody knows it. The Lotus Sutra says, ‘Even the present of the Buddha still had much jealousy to this sutra. To say nothing of after Buddha”’. 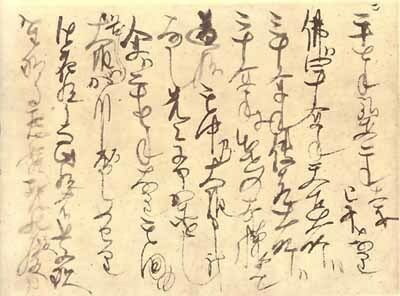 Now, in the second year of Kōan (1279), cyclical sign tsuchinoto-u, it has been twenty-seven years since I first proclaimed this teaching at Seichō-ji temple. It was at the hour of the horse [noon] on the twenty-eighth day of the fourth month in the fifth year of Kenchō (1253), cyclical sign mizunoto-ushi, on the southern side of the image hall in the Shobutsu-bō of Seichō-ji temple in Tōjō Village. Tōjō is now a district, but was then a part of Nagasa District of Awa Province. Here is located what was once the second, but is now the country’s most important center founded by Minamoto no Yoritomo, the general of the right, to supply provisions for the shrine of the Sun Goddess. In Nagasa Country of Awa Province there is a village called Tōjō that is now a country…..In this country, there is a temple called Seichōji. Facing toward the south, inside the Jibutsudō hall of Shobutsubō, I first spoke about the doctrine [Nam-Myoho-Renge-Kyo] at noon on the twenty-eighth day of the fourth month in the fifth year of Kenchō（1253）. Twenty-seven years have passed since then and it is currently the second year of Kō’an（1279）. In Nagasa District of Awa country there is a village called Tojo that is now a district. Here is the holy storehouse which was once the second in Japan, now is the highest rank. It was founded by Minamoto-no Yoritomo of the Right Side General, and supplies food for the shrine of the God of the sun. In the private Buddha statue hall inside the various halls which is called Seichoji temple in this district, I first spoke about this doctrine towards the south at noon on the twenty-eight day of April in the fifth year of Kencho(1253) that is the 50th cycle called 'a water and a bird' from a sexagenary cycle. Twenty-seven years have passed since then and it is currently the second year of Ko'an (1279) that is the thirty-third cycle called 'a soil and a hare'.